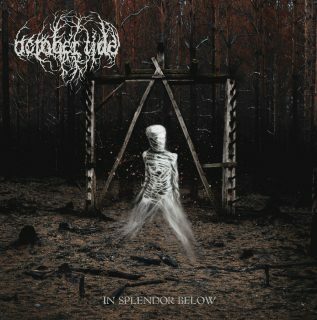 October Tide : In Splendor Below album download | Has it Leaked? With a history tracing back to the epicentre of melodic death metal in Sweden, OCTOBER TIDE have come a long way and have generated a spark that is strongly felt in the energy of the scene. "In Splendor Below" is the latest addition to their vibrant discography of guitar-driven, emotive death/doom metal art. It packs some of the most authentic and unique compositions from the capable hands of founding member and long-time Katatonia guitarist, Fredrik Norrman, his brother and guitarist Mattias Norrman (ex-Katatonia), vocalist Alexander Högbom (Demonical), bassist Johan Jönsegård (Letters From The Colony) and drummer Jonas Sköld (Letters From The Colony / Thenighttimeproject). While Fredrik prefers for the music to speak for itself, he finds the new album "a bit more aggressive, a bit more death metal, and with an overall colder feeling than previous records". Formed in 1995 by Katatonia members, Jonas Renkse (Bloodbath) and Fred Norrman, OCTOBER TIDE spawned two, now-cult releases, "Rain Without End" (1997) and "Grey Dawn" (1999), before going on hiatus for over eleven years. In 2009 Norrman parted ways with Katatonia, and resurrected OCTOBER TIDE, consolidating the band's reemergence with a new album titled "A Thin Shell", feat. Tobias Netzell of In Mourning on vocals. Since then, the band evolved through two more studio albums, "Tunnel Of No Light" (2013) and "Winged Waltz"(2016), both of which featured exceptional guitar work, on top of OCTOBER TIDE's emotional touch on death metal. "In Splendor Below" album was mixed and mastered by Karl Daniel Lidén at Tri-Lamd studios (Bloodbath, Katatonia, Breach, Craft). It was produced by Alexander Backlund from Nailvillage Studio (Thenighttimeproject / Letters From Colony) and October Tide. Tomarum av Christine Linde created the cover artwork.